Let me begin by welcoming the American Wheelchair Bowling Association (AWBA) to Mackmedia! We are always excited to help 501(3)(c) non-profit organizations and we are honored that the AWBA has selected Mackmedia. The AWBA has over 500 members throughout the continental United States. With an average of 10 tournaments a year, the attendance at the National level has grown to an average of over 100 participants, representing every skill level within wheelchair bowling. This article outlines a typical experience for new Mackmedia clients when switching from shared hosting to Mackmedia’s Fully Managed Website Hosting service. In this case study, we discuss how we were able to dramatically decreas the page load time for all pages on the AWBA’s website. Continue reading to see what you can expect from our Fully Managed Website Hosting infrastructure. Migrating to our hosting is seamless and happens behind the scenes without downtime. Your website visitors never know that the transition is being made – except they will notice that your website loads faster! A successful migration (without downtime) requires a lot of planning and attention to detail. The good news is that we take care of the hard work for our clients. Prior to migrating to Mackmedia’s website hosting infrastructure, the AWBA’s website was hosted in a shared Windows hosting environment. Take a look at the response time graph below – you can see that loading the home page took between ~1.5 seconds to over 5 seconds! And, this doesn’t take into account the time downloading related assets like images, style sheets and scripts! On occasion, the complete page load time would exceed 10 seconds! When you take into account the (poor) performance achieved, shared hosting is very expensive! Did you know that a slow website directly effects your bottom line? This is true even if your not a big business like Amazon. Although exact numbers vary slightly by source, the fact is that the slower your website, the less it converts! Did you know that search engine result page rankings are effected by the speed of your website? Page speed is one of many factors Google takes into account. If your website is slower than your competition, your website may rank lower. Your business website is often a customer’s first impression of your business. Ignoring your website visitor’s experience can be costly and send them searching for your competition! Usually, for small businesses, the first culprit is oversold shared hosting. The shared hosting business model is based on volume – cram as many clients on a single server as possible while keeping the percentage of complaints below a threshold. Hundreds or even thousands of websites are hosted on a single server! Items #1-4 are directly related to the website hosting infrastructure (i.e., shared hosting vs. managed hosting). Most business owners don’t have the time, energy, or desire to troubleshoot a poor performing website. With Mackmedia, you won’t need to! After migrating to Mackmedia’s website hosting infrastructure, the AWBA observed an immediate improvement in overall page load time! Take a look at the response time graph below – you can see the clear transition from shared hosting to our web servers and the immediate impact! Mackmedia fully manages hosting is really fast! Pages load in a fraction of a second. Our fully managed hosting infrastructure provides exceptional value to our clients! You may be asking – how can Mackmedia provide this level of service? We take hosting seriously! First of all, we don’t resell shared hosting. 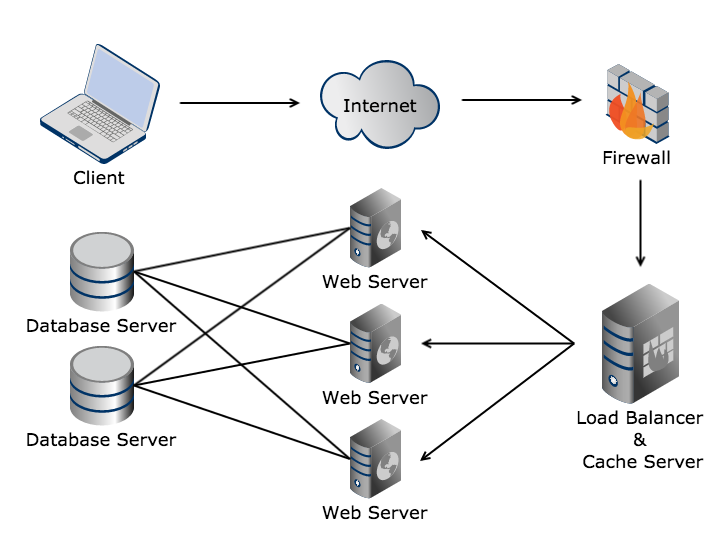 A typical shared hosting environment (pictured below) consists of a single server that acts as a web and database server (with hundreds or thousands of other clients). Mackmedia offers fully managed hosting services. Our hosting infrastructure consists of load balancers, cache servers, multiple web servers and multiple database servers. It takes considerable time and effort to setup a hosting environment that performs well for our clients. By scaling our hosting infrastructure out horizontally and balancing the load, our client’s website performance is exceptional in comparison to shared hosting! When selecting a company to help manage and maintain your organization’s website, be sure to ask the company what to expect out of their website hosting. A company that is focused on providing value to their clients will not resell shared hosting. They will host websites on an internally managed hosting infrastructure that is monitored and tuned for optimal performance. Our goal is to provide exceptional service and value to our clients, like the AWBA. If we aren’t helping you grow your business, we aren’t doing our job. Just one way we help is by providing website hosting services that are priced competitively for small to medium sized businesses, non-profit organizations and clubs. Let’s talk about how Mackmedia can improve your website page load time!